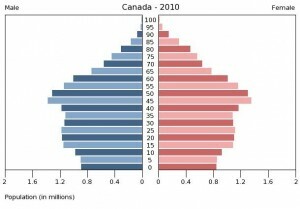 Results from the 2011 census show that Canada’s population has reached its peak in terms of productivity, and that the population of retirees will explode in coming years as the main bulk of baby boomer generation reaches retirement age. 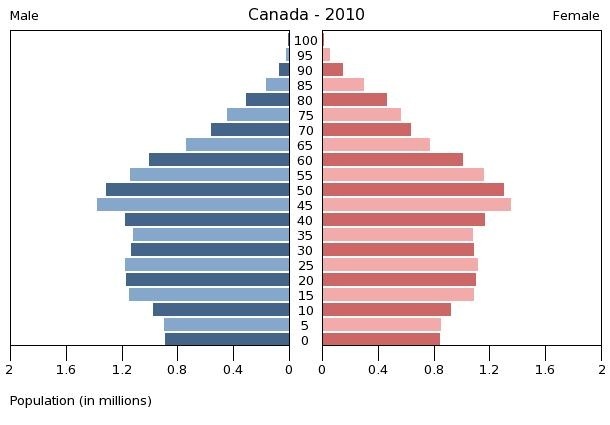 The census shows that Canada’s population has increased by 5.9 percent, to over 33.46 million, since 2006, the last time the census was taken. With the ratio of children to adults at a record low, the number of dependants per worker is also at historic lows, but the low number of children will mean that the working age population will shrink relative to dependents as today’s workers begin retiring in greater numbers and an insufficient number of children reach working age to replace them. Funding the Old Age Security (OAS) program and Medicare as their costs increase without a sufficient increase in tax revenue will consequently be a major problem for Canada in the coming years. Solutions proposed by commentators to the revenue shortfall include increased immigration, cuts to government spending, and creating personalized pension accounts that invest in the private sector to increase returns on social security payments.